While towns and cities are putting up official signs (see yesterday’s entry) to declare their inclusiveness of different people and cultures, one city neighborhood that hasn’t needed one for a while is Hillcrest, San Diego, referred as the city’s Greenwich Village. Village Hillcrest is corporate-run, chain-driven, and devoid of both housing and a diversity of unique, local restaurants with outdoor seating facing either the street or interior courtyard. 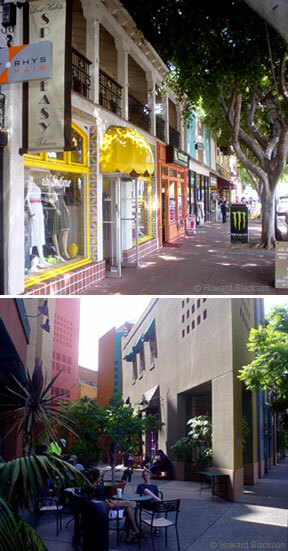 Meanwhile, the 5th Avenue retail district is a collection of local, authentic, independent restaurants and shops, with a rich array of neighborhood housing, dining, drinking and entertainment choices. Which one would you rather hang out in? Hillcrest has a sign. It’s at 6th and University Avenues. The collection of local, authentic, independent businesses on 5th avenue have seen about a dozen closures over the past 10 years or so. The only places that seem to thrive are Starbucks,the Wahshington Mutual bank and a pretty dingy gay bar.